Today we had a destination in mind! 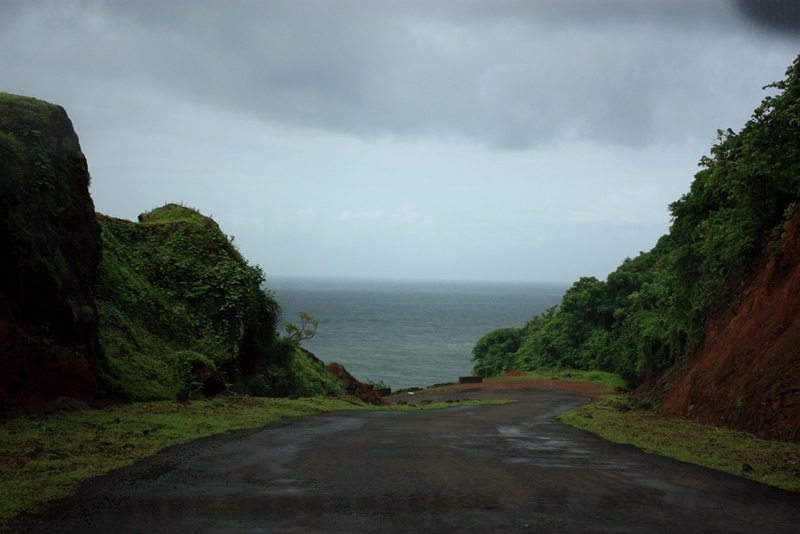 And as we were leaving Ganapati Pule, we were pretty excited about reaching Goa at the end of the day but the journey from Ganapati Pule to Goa via the coastal roads (not the highway) was so beautiful that we forgot about the destination fairly soon! If the drive from Bombay to Ganapati Pule was the cake, the drive from Ganapati Pule to Goa was the icing of the cake… Almost 5 years ago we had done a road trip along Route 1 in California and today’s drive reminded us of just that. The day started with some silent meditation and a dip in the ocean at Ganapati Pule. 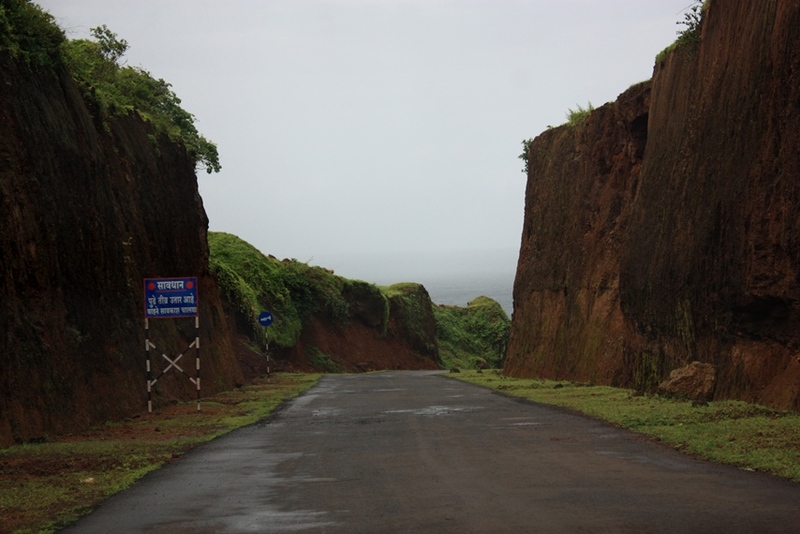 After a regular breakfast we left around 9:30am…As soon as we left Ganapati Pule and turned towards Ratnagiri, the road became parallel to the ocean! For a few minutes we were on a road cut into a mountain with walls on each side and suddenly as we turn left, we are right next to the ocean. And we stopped. Click click. as we started we were on a road cut through a mountain with walls on both sides..
slowly the road turned and we were next to the ocean! After 10 minutes we were at a high point on the road and we stopped. Click click. In the next 45 minutes we had hardly covered 10 kms. The view was just so amazing that we would stop every few kms and take pictures. After that we kept to taking pictures from the car itself. It was today that we had the best tea in our entire trip at a small village called Katradeviwadi. The chai had beautiful cardamom flavours and the guy gave us some vadas and bhajias along with it. When I told him that this was very tasty tea and if he added cardamom for us, he said this is his usual tea. And imagine 2 cups of tea, 2 plates of bhajia, 1 plate of vada and 1 packet of glucose biscuit – all for Rs. 20! We discovered a beautiful temple on the coast – kunteshwar. Near malvan region, we gave lift to a gift economy astronomer – Omkaar. We found a snorkeling destination called tarkarli. We had a malvan sea-food thali for lunch and instead of evening tea we had a tender coconut water break at Guhagar beach! For the entire route we were surrounded by shades of green and blue. As we went up the mountains, the road was flanked with forests on both sides; at the top there were grasslands as far as the eye could see and at times we had the ocean along us on one side and forest on another :).